Just down the eastern slope of Lake Tahoe is the oldest town in Nevada. 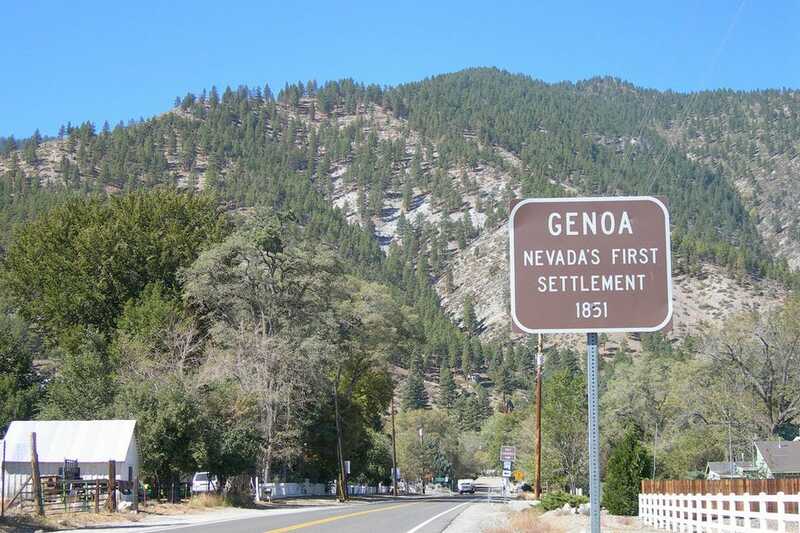 Genoa (pronounced juh-NO-ah rather than JEN-o-wah) was established in the 1850s by Mormons who set up a trading post in the location. It now is a small, quiet community with several historic bed and breakfasts, a few restaurants including the award-winning La Ferme and a small shopping area. The original Mormon Station is still located in a local park and the foothills of the Tahoe Range tower over the entire area while the beautiful Carson Valley spreads out to the east. Genoa is also home to several of the area's special events including the Genoa Candy Dance in the fall and the Cowboy Poetry & Music Festival in the spring. There are several things to do in Genoa including visiting the Mormon Station park and museum, doing some hiking in the foothills or just exploring the cute town on foot. Many people come here to also visit the historic David Walley's hot spring resort. Here you can stay at the resort while stepping into a half dozen warm to hot pools. The view of the Carson Valley from the pools is amazing and the resort also offers spa and massage services. The Genoa Bar is named Nevada's Oldest Thirst Parlor and it looks it. The crumbling, brick building has a ton of funky and historic charm and is a popular stop for motorcyclists on their way to Lake Tahoe. The bar serves up draft and bottle beer, wine and some cocktails, but you are safer staying with the tried and true Budweiser, Coors or PBR. The bartender is friendly and the place still has the original spiderwebs. There are several bed and breakfasts to stay at in Genoa and many of them are located in restored Victorian houses. One of these is the Genoa House Inn which is filled with antiques and private bathrooms with claw-foot tubs.This Victorian home has been restored and now offers various amenities. The inn features a library, a porch, meeting facilities and a fireplace in the lobby. Complimentary amenities include vehicle parking, a hot breakfast and high-speed wireless Internet access. Genoa's shopping area on the main road includes several boutique shops and several antique stores. One of the most distinguished is the Genoa Trading Company which is located in a historic building next to the Genoa Bar. They sell collectibles and antiques from the late 1800s as well as wool blankets, jewelry, clothing and Western home decor.